Advanced Football Analytics (formerly Advanced NFL Stats): What Happens To The Vikings If Favre Does Retire? How big is the difference between Brett Favre and the Vikings' next best option? 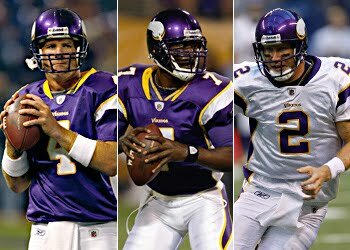 Last year a resurgent Favre led the Vikings to a first-round playoff bye.Tarvaris Jackson is currently the #2 QB. If we replaced Favre's passing performance with what we could expect from Jackson in the tried-and-true win-efficiency model, we can estimate how many fewer games Minnesota could expect to win. Favre had one of his best years of his career in 2009. He averaged 7.0 net Yard Per Attempt and posted a 1.3% interception rate, a career low. Together with their particular combination of running efficiency, defensive efficiencies, and penalty rate, the Vikings would typically be expected to win 10.1 games in a season. Together with a slightly softer than average schedule and a little luck, they notched 12 wins. In 2007 and 2008, Jackson's two seasons as a starter, he averaged 5.9 net YPA and 3.1% interception rate. Plugging those numbers into the 2009 Vikings yields 7.1 expected wins, a difference of 3.0 wins. That's huge. But could we really expect Favre to repeat his almost magical 2009? He would most likely regress a good deal toward his late career averages. His 1.3% interception rate was astonishingly low, and would be almost impossible to repeat. (His next-best season was 2.3% in 1995, and he's had multiple seasons with rates well above 4%.) In the latter half of his career, Favre posted about a 6.5 net YPA and 3.0% interception rate. That would be good for 8.6 expected wins, halving the difference between Favre and Jackson to 1.5 expected wins, still a considerable amount in a league where a couple wins can make the difference between a playoff berth and a losing record. What if we see Sage Rosenfels under center? It's hard to say because we haven't seen much of him at all as a Viking. His career numbers feature a very good 6.9 net YPA but also a very costly 5.2% interception rate, including a 5.3% rate in his 10 games as a starter in Houston. Plugging those numbers into the 2009 Vikings would produce 8.7 expected wins, but I'm suspicious of the accuracy of the model being fed such an outlier interception rate. There are many other variables that will ultimately determine how well the 2010 Vikings do. But I think somewhere between 3 and 1.5 wins is a good guess for the difference between Favre and no Favre. My guess is the fall will be considerably less than that. Obviously, the regression to the mean would occur. In addition to that, the effects of age would have had to start showing up eventually. Once you get into the late 30s, every additional year is a considerably lower mean expectation. On the other hand, Jackson is clearly on the upward slope of his career. Every year for him, the stats are better than the year before. I actually think he'll be a pretty good qb for them. I'd also note that the Vikings had an extremely good supporting cast for Favre last year. I think that had a lot to do with his breakout year. On the other hand, the Vikings had an extremely good year last year. Regression to the mean is definitely expected. If the question is how much different will Jackson '10 be from Favre '10, my hypothesis is not much. Of course, we'll never know what Favre would have done if he played. The comparison people will be making is between Jackson '10 and Favre '09. I think thats an unfair comparison because I really think 2009 was an outlier. Just a thought. Is there any correlation between pass efficiency and rushing efficiency, that would mean putting a worse QB in would have a knock-on effect to the Vikings rushing attack as defences start to play the run more? Certainly I’d expect the Vikings’ rushing to benefit from having the threat of Favre at QB. Similarly, I’d expect it to suffer without the threat of a future Hall of Fame QB. I would also think T-Jack's numbers would be much better than those you used for your model, however difficult they would be to quantify. Toward the end of that 2009 season when he won his job back, I would like to think that's how well he COULD do. But that's leaning toward subjectivity. Mike Golic said on Sportscenter today that Favre is "definitely" worth 3-4 wins. I wonder what statistics he's using.